Stuck into a muddy river bank, somewhere in Serbia, lies an old, derelict gravel barge. Rusted, useless, and over 100 years old it has limited heritage protection from the Serbian government due to the history it represents and helped make. For much of the last century, this ship has been called the Sava, named after the river which joins the long Danube at Belgrade, the capital of Serbia. 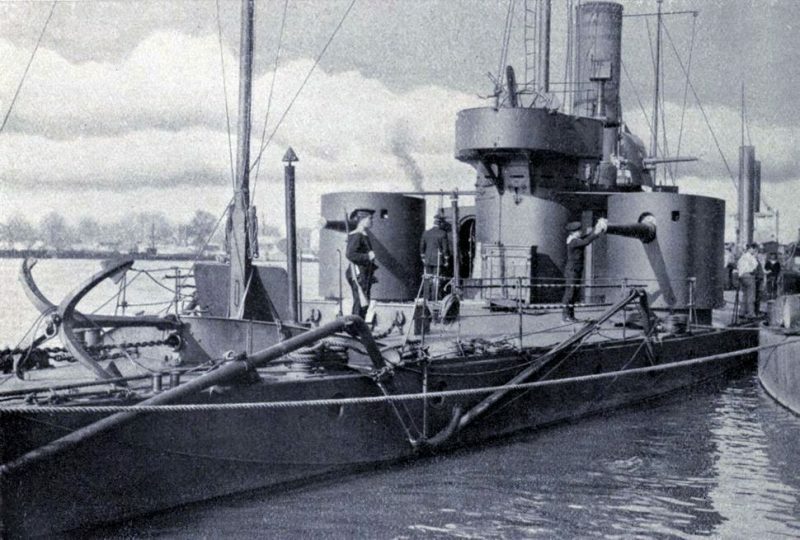 But once, it was a mighty beast which patrolled the Danube for the Austro-Hungarian Empire, fitted with elite armament and fired the first shots that began World War I—it was the river monitor SMS Bodrog. Between the time it was launched into service for the Austro-Hungarian Imperial and Royal Navy in 1904 and present day, the Bodrog (named after the river Bodrog) has sailed under the flags of four different nation-states. Its name was changed to Sava on April 15th, 1920, when it became a vessel of the KSCS (Kingdom of Serbs, Croats and Slovenes, later to be called the Kingdom of Yugoslavia) Navy. 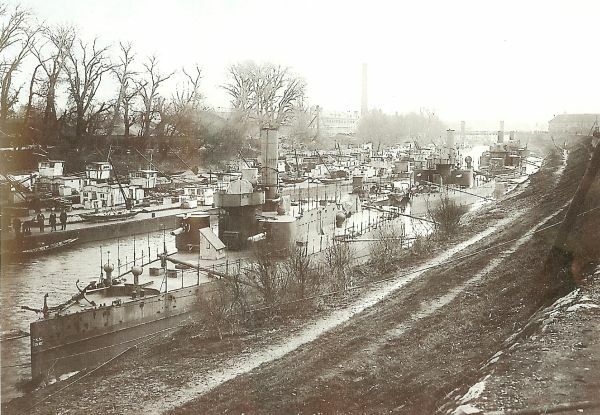 Charged with helping defend the Danube in both World Wars, this war machine has a long history of service before it was eventually refitted for industrial use in the 1960s. These were the specs for the Bodrog: “Like her sister ship SMS Temes, she had an overall length of 57.7 m (189 ft 4 in), a beam of 9.5 m (31 ft 2 in), and a normal draught of 1.2 m (3 ft 11 in). Her standard displacement was 440 tonnes (430 long tons), and her crew consisted of 86 officers and enlisted men. 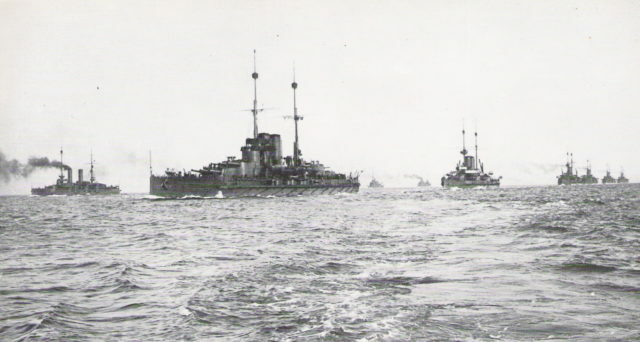 Austro-Hungarian fleet manoeuvres in February 1913. Bodrog was equipped with two Škoda 120mm guns, with a 10km range, a 120mm Howitzer mounted on a central pivot which could fire 20kg shells up to 6.3km, and two 37mm guns. Her armor ranged from 25mm on the deck up to 75mm on the conning tower. This top-of-the-line river monitor was part of the Danube Flotilla prior to and during WWI, in a division with three other monitors and three patrol boats. 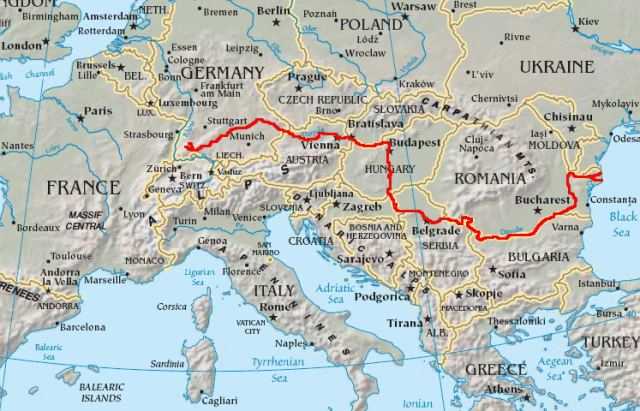 The Danube stretches from the Southwest corner of Germany all the way to the shores of the Black Sea. This Flotilla was a highly valued force of ships and essential to the Austro-Hungarians as much of the war that they fought to their East was with and against nations on the Danube. Also, they and the Germans strove to keep the Danube open for shipping supplies to their allies, the Ottomans via the Black Sea. When Austria-Hungary declared war on Serbia July 28th, 1914, that night the Bodrog and two other monitors stationed at Zenum, near Belgrade, bombarded the Serbian capital. Using their large guns, they rained shells on Serb fortifications and a railway bridge crossing the river Sava. The Serbs had no answer to these vicious river raiders and they would need naval guns from Russia and artillery support from France through the war just to hope to deter them. The Course of the Danube River. By early September, fearing a Serb counter-attack, the Austro-Hungarians retreated from Belgrade. Bodrog was sent out several times to bombard Serbian defenses and troops around Belgrade, which was back in the hands of the Austro-Hungarians in just over two months. But to the woe of the Central Empires, they had to retreat again in less than two weeks in the face of Serbian, Russian, and French forces marching on the city. On December 24th, 1914, Bodrog, along with the minesweeper SMS Almos, a patrol boat and two tugs, escorted the steamer Trinitas down the Danube. Trinitas was loaded with munitions bound for the Ottomans. They managed to slip past the heavy defenses of Belgrade, but were forced to turn back when they received word that the Russians had laid a minefield and log barriers just past the Iron Gates Gorge on the Serbia-Romania boarder. When British, French, and ANZAC troops landed on Gallipoli, fighting the Ottomans, desperately needed munitions were again sent to attempt the Danube to the Black Sea, guarded by the Bodrog and other boats. The steamer carrying the supplies, however, struck a mine, was shelled by artillery, and exploded. In October 1915, after Bulgaria joined the war on the side of the Central Empires, Belgrade was again captured by their combined forces. Bodrog and other monitors were essential for support as troops crossed the river near the Belgrade Fortress. The Bodrog’s battles moved further downstream and when Romania entered the war on the side of the Entente in August 1916, Bodrog’s Second Monitor Division was ordered to shell the Romanian river port of Giurgiu where they inflicted heavy damage. As control of the Danube was solidified, the Bodrog spent several months guarding Black Sea ports and ships in the Ukraine. But in October 1918, she was called back to the mouth of the Danube to protect retreating Austro-Hungarian troops. She was the last ship to head back to Budapest, bringing up the rear, when she struck a sandbar near Vinča in heavy fog and was abandoned. She would soon be captured by the Serbian Army. Serbia became part of the coalition of peoples that, by World War II, was the Kingdom of Yugoslavia, fighting against the Axis. Based in Dubovac, near the Romanian border, Sava and the 1st Monitor Division she was now part of, was assigned to defend that border against Axis invasion from Romania. During their withdrawal towards Belgrade, Sava and Vardar were repeatedly attacked by German Junkers Ju 87 Stuka dive bombers. More than a few Luftwaffe pilots were bested at the beginning of this invasion in April 1941 by the Sava and the Vardar (another Austro-Hungarian monitor built about a decade after the Bodrog). 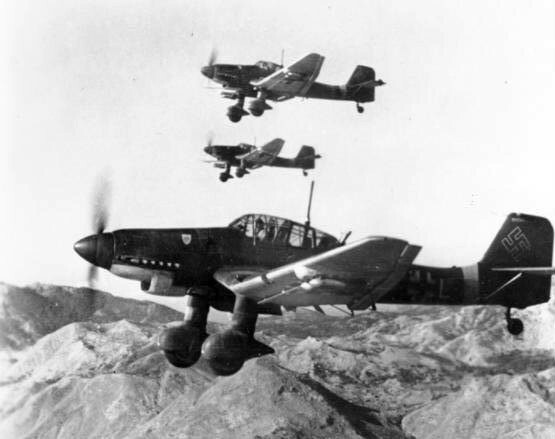 When the same two monitors went out for three days of laying mines along the Danube and were forced to retreat back to Dubovac, the Luftwaffe sent Junker Ju 87 Stuka bombers to sink them. The attacks were useless and the monitors unharmed by the aircraft that represented several decades of swift military advancement since the time these ships were laid down. As Yugoslavia fell to the Axis, Sava’s crew scuttled her and hoofed it across land. Sava was raised and refitted for service to the Independent State of Croatia (a puppet of Germany). Before the war ended, she was scuttled again by her crew. Afterwards, she was once again raised and refitted by the new Socialist Federal Republic of Yugoslavia, reinstated into military service in 1952, and retired into industrial work in 1962.